Injury to the body, both local (skin) and systemic, caused by high temperature. Thermal injuries lead to tissue damage by reduction of blood flow (ischemia) and tissue oxygen tension (hypoxia). Increasing in capillary permeability, edema, coagulation and thrombosis are the major factors of necrotic tissue formation that predisposes to infection and further damage of adjacent structure (bone, tendon and nerve). 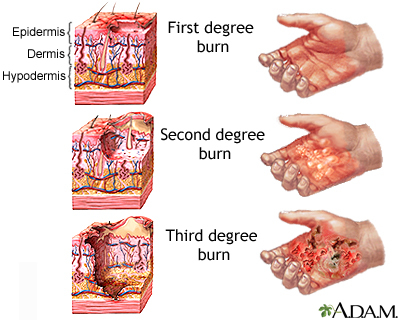 Burn injury not only damages the skin but all the system in the body. As a result of systemic response to inflammation and infection, sepsis develops which leads to shock and multiple organ failure such as lung, intestinal and kidney failure. Medical hyperbaric oxygen sessions are two hours long at depth of 2.4 to 2.8 ATA of pure oxygen pressure. At BaroMedical, hyperbaric oxygen sessions are given in mono-place chambers for better monitoring, comfort and safety. Number of hyperbaric oxygen sessions needed depend on the seriousness of the condition and can be determined upon evaluation of the microcirculation. At BaroMedical, the screening of the clients and the progress of the therapy are monitored with most advanced equipment: Laser Doppler blood flow, tissue oxygen monitor and digital camera. Wiseman DH, Grossman AR. : Hyperbaric oxygen in the treatment of burns. ; Crit Care Clin. 1985 Mar;1(1):129-45. Review. Hart GB, Strauss MB, Lennon PA, Whitcraft DD 3rd. : Treatment of smoke inhalation by hyperbaric oxygen. ; J Emerg Med. 1985;3(3):211-5. Nylander G, Nordström H, Eriksson E.: Effects of hyperbaric oxygen on oedema formation after a scald burn. Burns Incl Therm Inj. 1984 Feb;10(3):193-6. Waisbren BA, Schutz D, Collentine G, Banaszak E, Stern M.:Hyperbaric oxygen in severe burns. ; Burns Incl Therm Inj. 1982 Jan;8(3):176-9. Grossman AR. : Hyperbaric oxygen in the treatment of burns. ; Ann Plast Surg. 1978 Mar;1(2):163-71. Korn HN, Wheeler ES, Miller TA. : Effect of hyperbaric oxygen on second-degree burn wound healing. ; Arch Surg. 1977 Jun;112(6):732-7. Hammarlund C, Svedman C, Svedman P.: Hyperbaric oxygen treatment of healthy volunteers with u.v.-irradiated blister wounds. ; Burns. 1991 Aug;17(4):296-301. Cimşit M, Aktaş S.: Adjunctive hyperbaric oxygen therapy contributes healing in electrical injury: a case report of high voltage electrical injury. ; Ulus Travma Acil Cerrahi Derg. 2005 Apr;11(2):172-7. Villanueva E, Bennett MH, Wasiak J, Lehm JP. : Hyperbaric oxygen therapy for thermal burns. ; Cochrane Database Syst Rev. 2004;(3):CD004727. Review. von Heimburg D, Noah EM, Sieckmann UP, Pallua N.: Hyperbaric oxygen treatment in deep frostbite of both hands in a boy. ; Burns. 2001 Jun;27(4):404-8. Shoshani O, Shupak A, Barak A, Ullman Y, Ramon Y, Lindenbaum E, Peled Y.: Hyperbaric oxygen therapy for deep second degree burns: an experimental study in the guinea pig. ; Br J Plast Surg. 1998 Jan;51(1):67-73. Brannen AL, Still J, Haynes M, Orlet H, Rosenblum F, Law E, Thompson WO. : A randomized prospective trial of hyperbaric oxygen in a referral burn center population. ; Am Surg. 1997 Mar;63(3):205-8. Kindwall EP, Gottlieb LJ, Larson DL. : Hyperbaric oxygen therapy in plastic surgery: a review article. ; Plast Reconstr Surg. 1991 Nov;88(5):898-908. Review. Berg E, Barth E, Clarke D, Dooley L.: The use of adjunctive hyperbaric oxygen in treatment of orthopedic infections and problem wounds: an overview and case reports. ; J Invest Surg. 1989;2(4):409-21. Review. Noble R, Grossman R.: Therapeutic HBO: help or hindrance in burn patients with CO poisoning? ; J Burn Care Rehabil. 1988 Nov-Dec;9(6):581.